We acquired Sadie in October 2009 at eight weeks old. 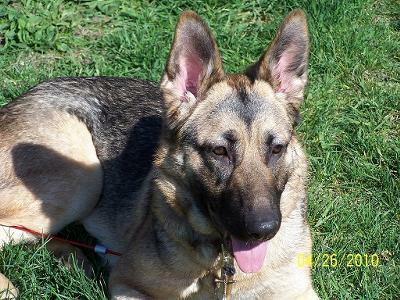 She was the last of an “oops” litter of German shepherd puppies. protective companion anyone could ask for. She learned all of her obedience commands by the time she was four months old, as well as many talented tricks. It took less than five minutes to teach her something new! This tightened our bond immensely. 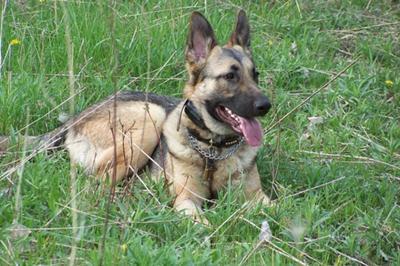 The X-rays of her pelvis also showed that she had bad hips and would have hip dysplasia later in life. After about six weeks, she finally got her cast off her leg and was able to get around fairly normal. suffering from liver failure that was most likely heredity or genetic. months old. It broke our hearts and saddened us deeply. She gave us countless laughs and always amazed us. We are truly grateful for the eight months of memories that she gave us and know she’s waiting at Rainbow Bridge to be reunited with her family again. She is irreplaceable and we miss her dearly. Kimberly, first of all let me tell you how sorry I am for your loss. It is so very hard to lose a wonderful German Shepherd but your memories will help you through it all and your memories will stick with you forever and help through your grieving process. 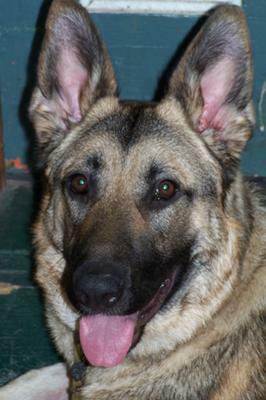 Thank you so much for sharing your story about your German Shepherd Dog, Sadie. I am so very sorry for your loss. What a wonderful dog your Sadie was.